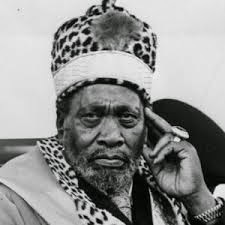 Jomo Kenyatta was born Kamau Wa Ngengi at Ng'enda village, Gatundu Division, Kiambu in 1889. He was the son of Muigai and Wambui.In 1896 his father died and Wambui was inherited by Muigai's younger brother Ngengi.That is the union through which James Muigai, Kamau's half-brother was born. Kamau's mother later returned to her parents where she died. Kamau moved from Ng'enda for Muthiga to live with his grandfather Kingu wa Magana who was a fortune teller and medicine man. He took interest in Agikuyu culture and customs and used to assist his grandfather in the practice of medicine. In 1909,Kamau joined Church of Scotland Mission, Thogoto, where he obtained elementary education and carpentry training. In 1912 he finished elementary school and became an apprentice carpenter. In 1913 he was circumcised at Nyogara stream near Thogoto Mission to become member of Kihiu Mwigi/Mebengi age group. He took interest in the political activities of the Kikuyu Central Association leaders James Beauttah and Joseph Kang'ethe. By 1926, he was the secretary of KCA. He was also chosen to represent the Kikuyu land problems before the Hilton Young Commission in Nairobi. This marked the beginning of his career in politics. In 1931, he again went to England to present a written petition to parliament. It is during this time that he met India's Mahatma Gandhi in November 1932. After giving evidence before the Morris Carter Commission, he proceeded to Moscow to study Economics at the invitation of George Padmore, a radical West Indian. He was forced to return to Britain by 1933 when Padmore fell out with the Russians and he continued with political campaigns in the UK. During the gold rush, land in Kakamega reserve was being distributed to settlers, something which angered Kenyatta causing him to speak about Britain's injustice. It is for this reason that the British dubbed him a communist. He taught Gikuyu at the University College, London and also wrote a book on the Kikuyu language in 1937. Under Professor Malinowski, he studied Anthropology at the famous London School of Economics (LSE). In 1938, he published a book entitled "Facing Mount Kenya". During the World War II, Kenyatta served on a farm in the United Kingdom .He owned his own farm in the UK. He married Edna Clarke, mother of his son, Peter Magana in 1942. Along with other African leaders, including Nkrumah of Ghana, he took part in the 5 th Pan-African Congress in 1945 at Manchester. When he returned to Kenya in 1946, he married Wanjiku, Senior Chief Koinange's daughter, who was the mother of his child, Jane Wambui. During his travels in the countryside at Kiambu, Murang'a and Nyeri, he always spoke to the local people on political matters. His last wife was Mama Ngina, the mother of Christine Uhuru, Anna Nyokabi and Muhoho. In 1947, he took over the leadership of KAU from James Gichuru. On October 20, 1952, Sir Evelyn, Baring, newly appointed Governor of Kenya, declared a state of emergency in the country. Jomo Kenyatta and other prominent leaders were arrested. He was tried at Kapenguria on April 8, 1953 for managing Mau Mau. He was sentenced to 7 years in imprison with hard labor and to indefinite restriction thereafter. On April 14, 1959, Jomo Kenyatta completed his sentence at Lokitaung but remained in restriction at Lodwar. Later, he was moved to Maralal, where he remained until August 1961. On August 14, 1961, he was allowed to return to his Gatundu home. On August 21, 1961, nine years after his arrest, he was freed from all restrictions. On June 1, 1963, Mzee Kenyatta became the first Prime Minister of self-governing Kenya. At midnight on December 12, 1963, at Uhuru Stadium, amid world leaders and multitudes of people, a new nation was born and a year later, on December 12, 1964, Kenya became a republic with Kenyatta as the President. 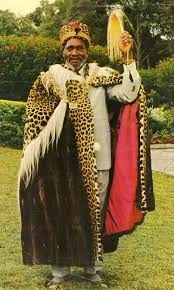 Mzee Kenyatta is acclaimed from all quarters of the world as a true son of Africa, a visionary leader. During his tenure, Kenya enjoyed political stability, and economic progress. In 1974, he declared free primary education up to primary grade 4. He is also remembered for urging Kenyans to preserve their culture and heritage. He died on 22nd August 1978 at 3.30 A.M. in Mombasa at the age of 89 years, while on a working holiday. Today, the late Kenyatta is widely acknowledged as one of the greatest men of the 20th century who played a key role in the independence of Kenya and other African nations. His name is always mentioned alongside the likes of Kwame Nkrumah and Julius Nyerere.